I've been wanting to try to shoot from the top of Oak Creek Canyon (right on the edge of the Mogollon Rim) for a quite a while now. I actually asked the Forest Service, since the specific area was closed at night, if it was ok to just walk in to where I wanted to go from a small off road equipment parking are. They said sure - be our guest. I have been waiting about 3 months for a reasonable "weather" window - the monsoons this year have just been endless. So, last night according to the weather radar, cloud cover satellite and the Sedona area webcams - it looked like it was going to be worth the 2 hour drive up there. 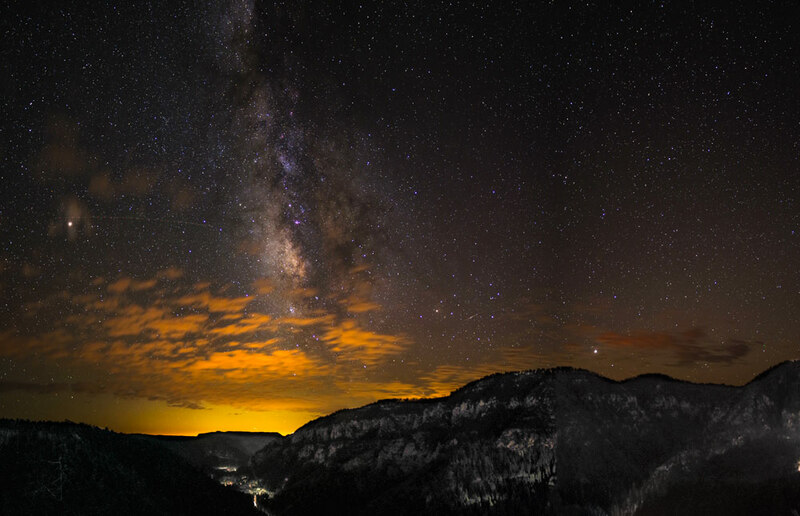 What I wanted to do is just shoot the Milky Way standing vertical up over Oak Creek Canyon. Pretty simple and straight forward. There is this vista location with pretty much the perfect location right on the rim, top of the canyon. It drops off 2,000 feet down in a third of a mile. There is a road the goes down the side of the canyon to the floor which is about 2.5 miles long with something like 10 switchbacks (yup - road car heaven). The switchbacks are off to the right hand side and also directly below the vista point. So, be careful of what you wish for...... What I learned. Make a list and check it twice - I forgot my external shutter release at the SUV, which was my intervalometer - so, I was somewhat limited to 30 second exposures. First time in years that I forgot it. The 2 second delay worked fine, and I took a number of 30 sec exposures (with LENR) to stack. Astrotracing mode - Up till last night, I would just calibrate and I would be set to shoot for the night. Last night I calibrated, and it was all good. Set to shoot and - no joy. In bulb, astro on, calibrated - nothing. Well, for what ever reason, which took about 10 minutes to figure out, the camera was not calibrated, so re-calibrating did it. I shot 49 frames last night and had to calibrate 5 times. It must have had to be something with the magical and mystical Sedona vortexs. I've been to the vista probably 20 times over the last 25 years. I knew what to expect, but everything is different at night. Bushes growing in all the "wrong" places. It was much much more difficult trying to find the best location to shoot from. I had a very good idea of the views that were available from daytime images (google earth street views, google earth overheads, just images posted on line, etc.). There are precious few images from night (posted on the web) - there are a few, but were taken right where the *%$#@ bush is growing very tall. You just work with what you have been given - and be happy. The headlights from the road - were so bright that they would just burn through, even with 30 sec exposures. F2.8 just made things worse. ISO 800 seemed to be fine, but there was no finding a happy balance with the road traffic. That was unfortunate. Also, on the last switchback on top the cars just shine directly into the side of lens (need to bring a piece of cardboard for a shade next time). Trying to time things is pretty hit and miss. I haven't figured out if it's better to shoot at ISO 400 longer in order to diffuse the headlight burn through. Just looking at the camera screen was difficult to tell. None of the detail showed up till this morning when I was post processing them. 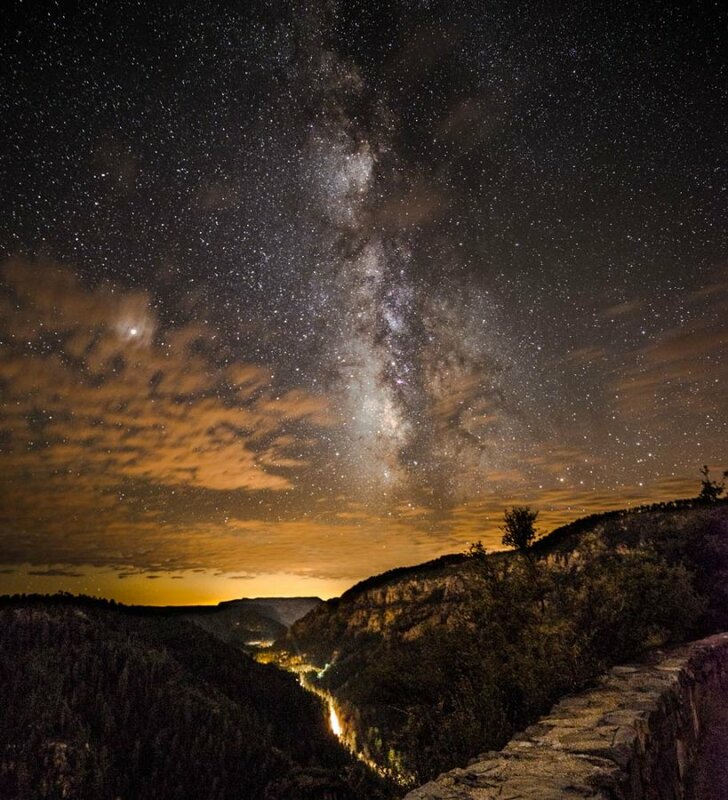 Sedona is one of the first International Dark Sky Communities. Driving through town, there are few street lights and everything is pretty subtly lite - and is 20 miles away down canyon. By eye, you see none of the light dome. Also, none of the lights within the canyon are really visible. However, that can make for some additional foreground interest down in the dark underneath the stars. I found - and what I didn't take in to account, was the overall brightness from the cars on the switchbacks. Interesting light patterns, but capturing them is difficult at best. I've found that for me, it's best to shoot one set at 30mm for relative high definition stitching, and a second set at 15mm, as somewhat of a test set, showing the potential of the 30mm set without doing a lot of post processing work. So, here are some test images. First image - K1, 15-30/f2.8 @ 30mm, f2.8, ISO 800, 60 seconds from the left side of the bush, which masked out the headlights. Did not use LENR on this set. Second image - K1, 15-30/f2.8 @ 15mm, f2.8, ISO 800, 60 seconds from the right side of the bush. This is a stitch of 3 images. I also shot a stitch of 5 images of pretty much the landscape, that I'm somewhat processing. This one has an oversampling artifact from Microsoft ICE. Upgraded software isn't in the budget yet my wife - the Chancellor of the Exchequer tells me (make due with what you have or shoot it perfect in the camera the first time, she tells me). Wonderful images and thanks for the shoot description. It's a pleasure to live in/near Dark Sky communities. I have one close too (within an hour drive). Tonopah/Goldfield region. Makes getting out for night photography a pleasing experience. Last edited by pcrichmond; 09-09-2018 at 07:19 PM. Reason: Added text. Excellent shots and description of what you did/had to do to pull it off. I have no experience with Milky Way shots, so your experience helps me. Plus I am familiar with the overlook and it is encouraging that the Forest Service was willing to work with you. Thanks for sharing it! Very nice. Do post more pictures and details of your technique. Even with the setbacks, these are some marvelous images! I read the previous posts about getting permission without realizing that I've been there. It is a great drive. Excellent shots! It's not so terrible to have to plan another visit to try again. Thanks for the encouragement. I've been touching up the images and trying different things - post processing and things have gotten a tad better. That and I have found that if I re post process the prior set of images just prior to going out again, I do get better images. Something like a little positive feedback loop, so when you are out in the field shooting, you are making somewhat better decisions on the fly. Yesterday (Monday) afternoon long about 2 to 2.30, I pulled up one of the many Sedona webcams and clear skies, clear radar, so Road Trip. Everything was pretty much ready to go (yea, right! more on this as you read). I actually found 2 additional batteries that I thought that I had lost up in Alaska, so I charged them on Sunday and I'm back up to having more than plenty of power in any event. I hit the road by 4.30 with a full tank of gas and rush hour traffic is not toooooo bad. Pick up a bite to eat on the way (Camp Verde is always a good location for a quick pit stop). I decide on the way to take a slightly different route - going up canyon, so as to get in possibly 2 locations in - as I am feeling really very confident this evening. I stop at West Fork that I shot this time last year, getting there at 7.30 and I'm early! Total darkness is at 8.00, and things are going pretty good. The Milky Way is not in the V of the canyon yet, so I scout for some good foreground interest, and sort of settle for about the best I can do in the meadow. There are some good sized trees that I didn't remember being there last year, but - whatever. I was sort of hoping for a better view of some of the canyon rock faces - but you shoot what is there, and not worry about it. Set up, calibrate astro, mount the camera on the pano head sitting on the geared head mounted on the tripod, so I can just shoot a fixed 20 degree vertical slices with LOTS of overlap. I adjust the moon lander articulating screen (I really like the articulating screen a lot). I plug in my external shutter release (I remembered it this time around), but the 2 second delay is still on - no big deal, push the shutter button ...... and then the little center AF [spot box] pops up in liveview and the lens starts auto focusing - *$#@^& and I instantly know that I no longer have focus, even with the focus ring taped down. So, I spend the better part of the next hour trying to manually focus both at 15mm and 30mm - no joy. So, I bagged it and head home empty handed. Just shoot me! The idiot behind the camera didn't check out the basic camera setup. Another lesson relearned the hard way once again. Famous last words. So, in a few minutes, I'm gonna go drive over to this little cul de sac on the side of a nearby hill a couple of miles away and re pre focus the lens on a set of hills about 10 miles away. Put the body in MANUAL while taping down the focus ring again, so I'll be all set for next time - perhaps tomorrow afternoon - again. I am running out of no moon days this moon phase (the rest of the week) and there is a high pressure system over Sedona all week, so clear skies and no clouds. So, what was hoping to accomplish with this outing? On Saturday night, I shot at 60, 90 and 120 second astrotracked exposures. I had shot previously at 50 seconds and was VERY happy (no star trailing in the corners at 15mm). I didn't want to press my luck so I was sort of staying at 50 seconds for the most part of this year. This time, I decided that since 60 seconds was good and that there was just the ever so slightest trailing at 90 seconds, with some minor trailing at 120 seconds, I would go for 70 seconds. That would be 40% more star light captured. I've been looking at the take from star trackers at 2 to 5 minutes and yes, there is a lot more light and brightness as well as color, but to me it appears to be unnaturally bright. I want something a bit more natural, and I think that 70 seconds will do it. Even with my slightly out of focus shots at 70 seconds, for me this is going to be the new standard. Fort he K1, ISO800 has been outstanding. I've been toying around with perhaps going with 400 due to the headlights, but - I do think that 800 is better. On Saturday night - everyone was shooting the canyon (think road car rally), there was substantially less traffic on Monday evening, so I think that traffic volume was the main problem I was seeing on Saturday. The problem is that you need to have enough definition of the dark areas, and shooting the landscape segments at 2 minutes at 800 is probably better than 400 at 4 minutes - and then there is LENR which will double all the times. You need to balance out the exposure time with LENR against the brightness. Bringing my external shutter release (with a timer / intervalometer) - provides this. Plus, you can check the image and if there is a burn-in, just retake it. LENR even though it doubles the exposure time is worth it for the K1 - it eliminates the white dots (my only real complaint about the K1). The canyon activity, down in the canyon, showed up nicely on Saturday, but on Monday there was substantially less (fewer campers), but there were still the canyon resorts, cabins, retreats - so I'm thinking that 2 minute exposures should do nicely - for the landscape images for the foreground. I did a couple 30 second exposures for stacking, and they were not too bad, so again 2 minutes feels like a good number. Of all the landscape shots I took, I didn't take nearly enough on Saturday. I actually thought about this while I was there and though that I was find. When in doubt, take more. I was going 5 images wide. I should have gone at least 6 to have more material to really get a good handle when post processing, how wide is sufficient. In looking at the images I did take with the headlights, they were substantially better with some post processing and VERY usable. I'm really sorry I decided to not take the images that appeared to be really blown out. They would have turned out better than what I was thinking. Also, while I was there, I was thinking about putting the tripod legs (at least one or two) up on the rock wall. Yup, I should have done that. That I think would have provided just a bit more freedom in terms of formatting the shots. Shooting two sets of images - one at 15mm and the other at 30mm, turns out to be a real advantage. There is a real difference in detail with the 30mm image set. The 15mm set is essentially the quick look set, that shows the potential or lack of potential in the 30mm set. Also, the processing time is minimal. Four years ago, I had decided to stay with the K5, and not go with the K1 when it eventually came out whenever. So, I saved up for the Sigma 18-35/f1.8 lens, which for astro works great. I had tried it out a year ago on the k1, but with stitching it appeared to patch work things in with a lot of vignetting (on the K1 at 35mm). I'm thinking that it was oversampling errors using Microsoft ICE, so I want to try it again. The f1.8 is a good stop and a third faster than f2.8, and I could stop down to f2 and still gain a full stop (plus another 40% with 70 second exposures). Since I already have the lens, there is no reason not to try it out and see what results it produces, especially with stitching. It would also be interesting to see the astro color rendering in comparison to the Pentax coatings on the 15-30. Photoshop - Even though my wife - the Chancellor of the Exchequer tells me it's updating everything I have on the list is not in the budget, Photoshop CC - I hate subscriptions, and Adobe in general, but it will help everything immensely. I think that she will go for PS. Last edited by interested_observer; 09-11-2018 at 05:49 PM. I love how the sun looks like it's lighting up the milky way in the second shot. Great shot! This shot is looking south from the top of Oak Creek Canyon. The light dome on the left hand side is the town of Sedona about 20 miles away down canyon. The light trails on the left side is highway 89A which follows the canyon floor. 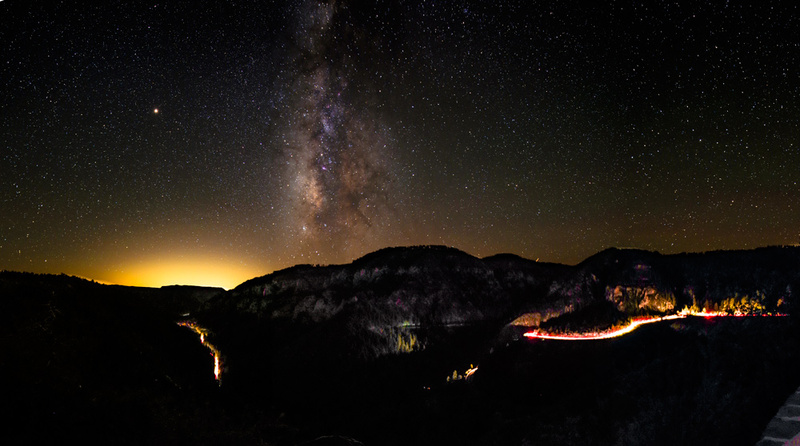 The light trails on the right side is highway 89A coming up the canyon with switchbacks along the canyon walls, climbing about 2,000 feet in 2.5 miles or about a third of a mile as the crow flies. Per request - this how I took the images and how I processed it. Image Capture - K1,15-30/f2.8 @ 15mm, f2.8, ISO 800 at 70 seconds, portrait (vertical) orientation. Shot off a tripod and head. LENR (long exposure noise reduction) was on, to hold down the noise in the foreground. Shot 6 vertical slices. The Angle of View of the lens is 111° - 72° @ 15mm, so the raws are 111° tall, and each slice is 72° wide. I shot off of a nodal ninja pano head (I didn't have to, but I had it so I did). I moved each frame 20°, so there is about 50°+ of overlap. I should have probably moved two 20° sets, and only shot 3 images (with 30°+ of overlap), but whatever. I had lots of overlap. Image Processing - Stitched the 6 raw images with Microsoft ICE, saving the result as a PNG file. Imported the PNG into Lightroom 5.7. The in-camera LENR did an excellent job overall on the noise. Then just applied black, white, shadows, highlights and contrast for the sky (bringing the Milky Way out in a reasonable manner - not over cooked), then used the adjustment brush on the foreground and then make adjustments exposure, contrast, vibrant, clarity and highlights to bring out some detail in the foreground. Then cropped off about 20% on the bottom which was some uninteresting bushes and a wall, along with about 20% on the right side to remove the rest of a rock wall that added nothing to the overall image. The resulting image is 12,500 x 8,300 which I compressed down to 1000 x 550 for posting here. I just did the minimal processing to bring out the MW and a bit to pull out some details / interest in the foreground. I love it. Please share more how you took the picture and especially how you processed the image. Hi Lake, I updated the image description in the posted text providing the information. Thanks for asking! !